This book aims to take pumped hydro storage (PHS) underground. PHS is worldwide the dominant technology for balancing power supply and demand. Surplus green power is used to pump water up into a reservoir at elevated heights. During high demand water is released, passing through a turbine connected to a power generator. 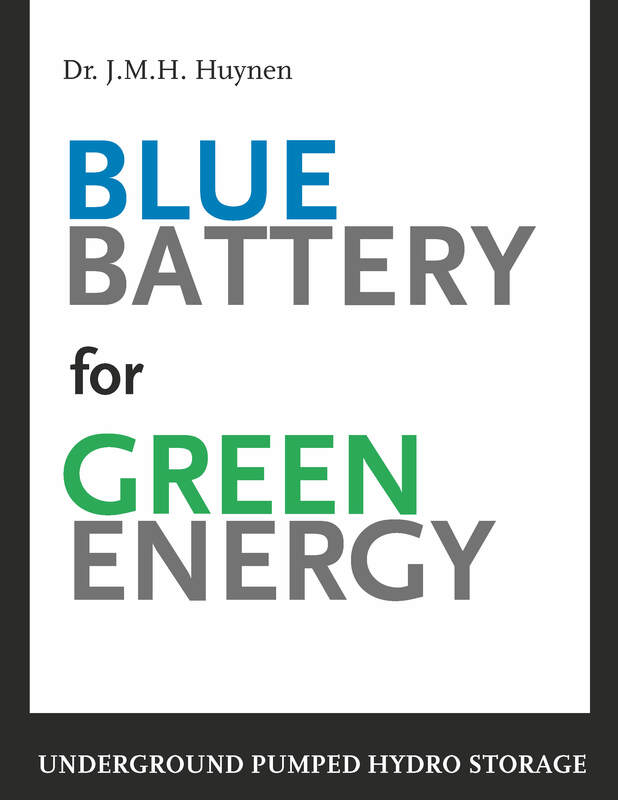 Blue battery for green energy takes the Netherlands as the context for a first underground PHS project. It discusses the Dutch energy system and its transition to sustainable energy. It covers geological requirements, design, construction and economy of an underground PHS project. Underground PHS is not only a flatland solution for a flat country. It is also a smart way of using the underground to preserve the surface of the earth - wherever in the world. 'None of the candidate technologies for massive-scale renewable/sustainable generation of 'green' electricity deliver it in a form suitable for high-efficiency storage. None of the prospectively-massive storage modes for transformed-electricity is at present well enough developed to be designated a sovereign remedy for intermittency'. Prof. William F. Pickard. Jan Huynen is an economist, energy expert and serial entrepreneur in Maastricht, the Netherlands. He founded the event and congress centre MECC Maastricht and the world's largest art fair TEFAF. In the 1980s he became involved in energy storage as a vice president of the Belgian electromechanical company ACEC. Since that time he has studied the possibilities to take pumped hydro storage underground. Jan Huynen is a Doctor of Social Science as well as Geosciences.